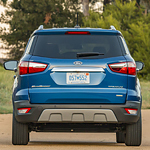 The 2018 Ford EcoSport is a compact family SUV that has a lineup of four stylish trims. Up to five people can ride in this inexpensive crossover SUV that's available for a test drive at Mullinax Ford of Kissimmee. As a lightweight vehicle that's optimized for the city, the EcoSport includes numerous driving aides. For example, the Reverse Sensing System has ultrasonic sensors that essentially give you an extra pair of eyes for backing up. If you get too close to another parked automobile or stationary obstacle, the system will issue loud chimes in the dashboard. A rear view camera also provides live feeds to the signature SYNC display in the cockpit. This versatile Ford crossover SUV also has exterior amenities that improve your confidence on any road. Powered by halogen, the quad-beam headlights produce powerful illumination. You can turn on the front fog lights for better vision in certain situations.